If you are interested in purchasing or renting a new pair of alpine skies, you might be interested in looking at an online ski length calculator. LoveToKnow's calculator can give you a quick and easy result. Using an online ski length calculator can be a helpful tool for selecting the best ski size, especially if you are shopping online for the best prices. Please use our calculator widget below to find the best ski size for you! You will notice that the calculator featured in this article asks for your height and ability level. Both of these factors will have a significant effect on the ski length recommendation. For example, a shorter person will usually do better on a shorter ski. 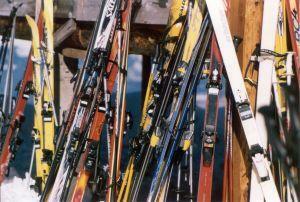 Ability also plays an important role in choosing ski length. If, when you first learned to ski, you bought a lift, lesson and equipment rental package, the resort might have used what is known as the Graduated Length Method. On your first day of lessons, you might have been given a pair of 115 centimeter skis . As you became more proficient, you were given longer skis. However, while shorter skis are easier to maneuver in steeper terrain, they may not provide enough support and balance in steeper terrain. Thus, a longer ski is suggested. In the long run, the best way to determine your ideal ski length is to demo different sizes of the model that interests you. In fact, by using the information obtained from the calculator, you can go to RentSkis.com and fill in a request. This site works in conjunction with most ski shops throughout the United States. Since you already know your preferred length, you can save time at the slopes by setting up your demo in advance. Many shops apply the demo price to the price of the ski, should you decide to purchase it, and most will not charge you extra for trying the same model in a different length. Be sure to jot down the suggested lengths for the various ability levels. Then, actually try the skis out in those conditions. If you are skiing with a friend, you might want to ask them to video your skiing with different ski lengths. While the calculator can give you a ballpark figure for the correct length, the camera provides a more precise evaluation of your skills.